Can Core M be Intel's tablet saviour? Similar to its great buddy Microsoft, Intel found itself horrifically late to the tablet party. Both companies had tried to push the form factor before. The 2002's Tablet PC was a thick and clunky eight-year early tablet based around Windows XP Tablet Edition and failed to get any traction outside of businesses. Both companies made a fatal error at the time – they believed that people wanted tablets to do everything that a PC could. And, of course, that meant running Windows. Caught off guard by Apple's iPad, both companies knew they needed to do something. The Atom experiment was a disaster; some of the designs from well-known OEMs offered an extremely poor user experience for using Windows 8. The CPU just wasn't up to the job. The 2-in-1 market, however, is a sizable area of potential gain for Intel. The market is still very young, but the signs are encouraging – 50 per cent of people that have bought a 2-in-1 say they were previously considering a tablet, while there are more 70 system designs now on the market across all screen sizes. 2-in-1s are for people that still want to use x86 and x64 apps and have a device that can be used as a tablet. While Intel has long produced CULV (Consumer Ultra-Low Voltage) processors for tablets including the Haswell Core i3, i5 and i7 variants in the Surface Pro 3, something still needed to change. Intel has the computing power, but battery life was a major weakness until now. Enter the 14 nanometer die shrink of Haswell. 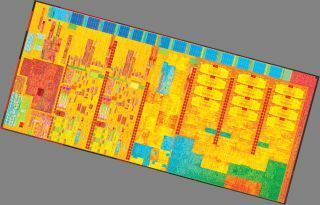 Codenamed Broadwell, this is a launch that – relatively unusually for Intel in recent times - has been delayed, and after originally being promised the bulk of the CPUs (including those for desktops and full laptops) in late 2014, these will most likely hit in early 2015 (Intel says they "will be in volume production before year end"). We expect them to see a full launch at CES 2015. But today sees an advance party for Broadwell in the form of Intel Core M. These Broadwell CPUs are designed specifically for tablets and 2-in-1s as well as very thin laptops (whether they'll fit into the Ultraboook category remains to be seen). And they're fanless, yet with Core-level performance. The key to this is 14nm die shrink that has enabled the TDP (thermal design power) of the system-on-chip to sink below 6W and even down to 4.5W depending on design. This compares to TDPs of 17-18W only a couple of years ago. Improved packaging also enables more compact designs – the equivalent Haswell Core package was 960mm^2, whereas Core M's packaging is almost half that. This translates into designs that are designs that are thinner than 9mm. Intel sees the biggest market for 2-in-1s are people who bought a PC around 3-5 years ago and who are now looking to upgrade. Intel also believes Core M powered devices can entice those who were previously just looking for an Android or iOS tablet, but who value the multitasking value of Windows, flexible file storage and capabilities of a full Windows PC. Core M is available in dual core versions for now, the latter having 1.3 billion transistors. 4MB of L3 Cache is shared across the cores and the on-die graphics. Core M utilises Intel's HD 5300 Graphics which supports resolutions up to 4K (3,840 vs 2,160). There are three variants of the Core M; 5Y70, 5Y10a and 5Y10 (capable of going to 4W). The key difference is the clock – 2.6Ghz for the 5Y70, while the others are 2.0Ghz. All these chips are dual-core, four thread processors but expect some other variants as time goes on. With Core M, Intel is promising performance improvements for graphics and video of 7% and a more modest increase of around 2% for productivity tasks over 'a four year-old notebook' – that's comparing a Core M-5Y70 with the Core i5-520UM chip. The key thing here though is that there has been a significant reduction in TDP, 18W vs 4.5W. That power reduction means a significant uplift in battery life – Intel is talking somewhere in the region if 1.7 hours versus a previous generation system. As you can see from this chart, the main power consumer is the screen (no surprise), but Broadwell brings a distinct saving when it comes to the system-on-chip as well as, interestingly, audio. This is down to Intel's SmartSound audio processing technology that enables features such as wake -on-voice. Also part of the Core M platform is 802.11ac wireless (Intel Wireless-AC 7265) and 5Y70 is compatible with Intel's vPro for business deployments, Windows InstantGo and Platform Trust Technology. There's also support for Intel's Rapid Storage tech. As for pricing, Intel is predictably talking about the 2-in-1 market predominantly – machines around the $900 mark (around £550, AU$950). But Intel reckons Core M could easily be homed in cheaper tablets – those around the $500 mark (around £300, AU$530) - and we'll have to wait to see what OEMs announce in due course. Intel says somewhere in the region of 20 system designs are being developed using Core M and a handful of systems will arrive in October across both consumer and business SKUs. The first of these – launched at IFA 2014 - is the new-generation Lenovo ThinkPad Helix 2 in 1 that clocks in at 800g. It's 9.6mm thick, with a 11.6-inch Full HD display.